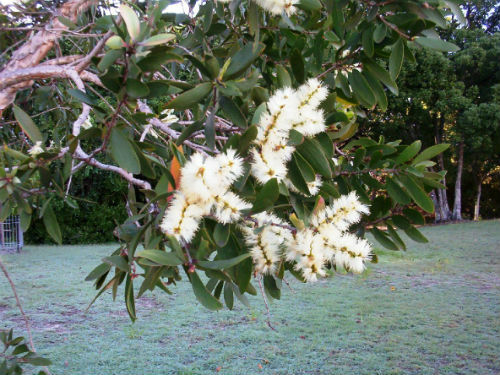 Melaleuca quinquernervia, Broad-leaved Paperbark, is a medium to tall tree. The bark is papery and peels off in strips. Leaves are alternate, lanceolate to elliptical, 30-70 millimetres long, usually with five prominent veins and with a stiff, leathery texture. Flowers are held in bottlebrush-like spikes up to five centimetres long, white or cream and make an appearance in autumn and winter. Flowers attract nectar feeding birds and flying foxes. Aboriginal people used the bark for wrapping and cooking food. They also used an infusion of the leaves as a treatment for coughs and colds. The wood may be used for light construction but saws and planes are blunted because timber contains silica. Timber in the round is used for house stumps and fence posts. The Broad-leaved Paperbark will tolerate both dry and very wet conditions. The species often grows in pure stands in wetlands along coastal Queensland and NSW, north from Botany Bay. M. quinquernervia also occurs in New Guinea and New Caledonia. The Broad-leaved Paperbark has been used as a street tree and would be at home as a specimen tree or as a component of shelterbelts and windbreaks. M. quinquernervia is not highly thought of in Florida, USA where it has become an environmental weed. “Punk Tree” is its derogatory name in Florida. The species name means five veins and refers to the leaf veins.